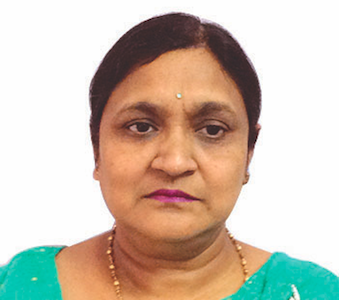 Suman Govil, a Scientific Officer at the Department of BioTechnology (DBT), has been associated with Human Resource Development Programmes of the Department for over 30 years. Hailing from Delhi, she obtained her MSc and MPhil in Botany from Delhi University, where she also went on to do a PhD. Known to be a proactive, social person, she believes that quality manpower holds the key to success in every area. This has motivated her to work on education and training projects that aim to produce world class manpower in Biotechnology in India. She has initiated postgraduate and post-doctoral teaching programmes in Biotechnology in more than 70 universities in the country. Her pet project, the Star College Scheme, has enabled the integration of research into undergraduate science education. Through her blog, Opportunities and Concerns in Biotechnology, she communicates information about latest policies and schemes and shares exciting science news. She spoke with IndiaBioscience about her career choice and her work as a science administrator. You were pursuing a PhD in Botany before you joined the Department of Science and Technology (DST). What prompted you to move out of the domains of a wet lab? To be honest, it was not an urge to move out of a wet lab. I had registered for a PhD and had a couple of publications to my name. I happened to find out about a job opportunity in Department of Science & Technology (DST) and applied for it. After the interview, I was offered post higher than the one I had applied for and I decided to join on the strength of advice from my seniors. Did you receive any formal training to get into the domain of administration? I did not receive any formal training. I have learnt on the job and from my superiors. How has been your journey over these years and how it has evolved? I began my career in 1982 and have worked in different capacities. My first posting was in the National Biotechnology Board (NBTB). With upgradation of NBTB to DBT, I moved to DBT. Since then, there has been no looking back. I joined when I was very young and got opportunity to learn from luminaries like Prof Dr. S. Ramachandran, Founder secretary of DBT and Dr MGK Menon, Secretary, DST. I have worked under the guidance of Prof MS Swaminathan—I had read about him as father of green revolution—when he was chairperson for the Women Bioscience Awards Committee. In addition to his professional achievements, his personality, his accessibility, and appreciation for others have influenced me tremendously. I have had many such mentors who have left a deep impression on me. More recently, Dr Bhan and Dr VijayRaghavan’s philosophy of giving unquestioned freedom to officers has allowed us to flourish and become experts in our own fields. These interactions have helped me greatly in formulation and smooth implementation of different programmes of the Department. DBT is by far one of the best scientific departments in the Government system. Our officers take lot of pride in achievements of DBT. You went back to complete your PhD long after finishing your Masters. Do you think that step helped you to deal with the challenges of science administration better? After a few years of professional life, I decided to register for a PhD again . I decided to study “Technology forecasting in plant tissue culture”, a topic which would be relevant to my job. I was particularly encouraged by my father, who was very keen that I complete my PhD—the degree also gets respectability in the system. Earning a PhD also boosts one’s own confidence. You have worked on many different schemes and projects ranging from the Integrated human resource development programme in Biotechnology to the Star college scheme. Tell us about some projects that you have enjoyed working on. I have been associated with the initiation of a post-graduate teaching programme in Biotechnology and we are the first country in the world to have Masters of Science in Biotechnology. Such DBT-supported teaching programmes are still rated among the best in the country. I have also been involved in setting up of infrastructural facilities, R&D projects in the area of medicinal and aromatic plants, environmental biotechnology. We established 3 National Gene Banks and held several workshops with tanneries, refineries, pesticides and dye manufacturing industries, and developed need-based projects to find solutions for these industries. In human resource development, I conceived the Star College Scheme under the guidance of Dr MK Bhan. This is a scheme I’m partial to, as it helps to provide practical and research exposure to undergraduate students. This scheme has transformed undergraduate science education by collaborative participation of science departments. What would you say have been the highs and lows of your journey? Like I mentioned earlier, my job has offered the opportunity to work with visionaries. I have learnt a lot from their guidance and mentorship. On the flip side, delays in release of grants, at times beyond your control, are very frustrating. Mails from students about delay in disbursement of fellowships are very painful as I am able to relate to their problems and in spite of sensitivity and sensibility, things are beyond our control and we are not able to provide instant solutions. What difference have you been able to make to the growth of science research and teaching in the country as an administrator? What are your future goals, both immediate and long-term? For a substantial part of my career, I have been involved in formulation and implementation of integrated human resource development programmes. I have been very closely interacting with undergraduate and postgraduate students, research scholars, postdoctoral fellows, and have tried to appropriately include their suggestions. I am responsible for initiating and nurturing the postgraduate teaching programme, the Star college scheme, in addition to the Biotechnology Industrial Training programme, short term training courses, doctoral and post doctoral fellowships in Biotechnology. I have compiled and edited 4 publications and written several articles in Biospectrum targeted at students. I have also initiated a blog on Opportunities and Concerns in Biotechnology. My goals are to constantly improve the programmes on the basis of feedback and suggestions from all stakeholders. Post retirement, I would like to aggressively pursue science communication and help students. What makes one a good science administrator? A science administrator should be accessible so than he/she can understand the requirements and difficulties of scientists in the field. Science administrators should also be unbiased, transparent, sensitive and sensible to the difficulties faced by the investigators, willing to help them overcome procedural hurdles in their institutions. It also helps to be a good listener, and a team person willing to interact and learn from others, possess updated knowledge about the field and have good communication skills to obtain necessary approvals. What would be your advice to someone interested in following a similar career path? I think career decisions should be made on the basis of one’s interest. Wrong choices could be very detrimental for the candidate and organisation. Once you decide to be science administrator, you should not compare yourself with active scientists in laboratories as this would only breed dissatisfaction. Be willing to give your 100% and sky is the limit. There are tremendous opportunities to contribute. Improving the quality of doctoral students - is incentivising output the way to go?